A Local Service ads click study, sheds some light on how the users interact with local service ads and how it affects organic results. A total of 5500 “impartial internet users” participated in this study and gave us some invaluable insight into how the local service ads impact the overall results and click through rate. Local service ads get 13.8% of the overall Google local search clicks. The local service ads on the top of the search result receives the highest clicks while the lowest one receives the least clicks. The first organic result gets the highest number of clicks. Local service ads encourage people to click on paid ads. When it’s live paid ads get 25.3% of all the clicks, while they are absent, the paid ads receive a mere 14.6%. Review & ratings are the biggest driver of clicks in the local search result. As much as 91% of customers read reviews while shopping online, and that is why the reviews are the number one factor that customers pay attention to when evaluating a local business. Reviews not only help you generate trust among your prospects but also help you stand out from the crowd as it looks good to the eyes too. Customers prefer a business which has a healthy number of reviews and it increases the click-through rate up to 25%. The more reviews a business has, the more customers they will get as people generally prefer popular business as compared to the new one, because taking risk is not something we as a human-like to do, very often. And this is why you should be paying more attention to reviews. If your product or service is good, then it is highly likely that there will be happy customers, who are willing to invest some time and effort in writing reviews. To help you get more reviews for your business, we highly recommend our review widget. It’s a small piece of code which is placed on your website and helps you get positive reviews on Google, Yelp and Facebook. In addition, it helps to filter out negative reviews too thus ensuring positive experience to website users. Need more details? Please connect with us. Google rolled out Google My Business agency dashboard in June. It was launched to help agencies manage a large number of listings. But many agencies faced issues while migrating to the new agency dashboard. To help them out, Google has launched a new tool to streamline the entire process. First, you have to decide whether you want to shift completely to the GMB agency dashboard or not. So far the migration of the location has been the biggest hurdle. In case you decide to shift to the new GMB, Google is offering you two ways to do so. 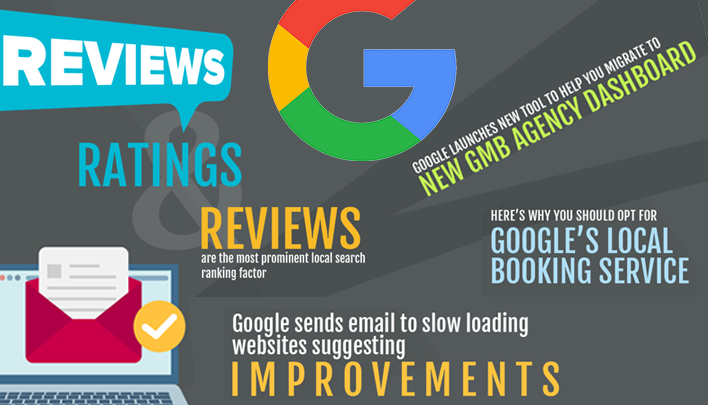 Assisted Migration: In order to encourage hesitating agencies to shift to the new GMB agency dashboard, Google is ready to offer them personal assistance in migrating the locations and accounts. It’s good for agencies who have a lot of locations to move. You just have to request for the assisted move and for that, you will need to log into your GMB agency account, then go the Overview tab, click the Got existing locations to transfer? and follow the instructions from there. It will take around 48 hours to complete the entire process and then you can see all of the locations in the manage location tab of your agency account. Self-migration: You can opt for this option if you are managing only a few locations. In order to transfer the locations into your new agency account, you will have to request access to each location or location group manually from your agency account and then accept the request from your personal account. The steps can differ based on the number of locations, so make sure you read Google’s support page. We would like to inform you that it’s far easier to manage multiple locations and accounts on the agency dashboard than the private account. Google has also fixed the bugs from the initial launch, so we highly recommend you to use the agency account. Google is sending emails to site owners who are struggling with site speed via Google Search Console. The intention is to help them identify and fix the slow loading pages. Here’s the email. Our takeaway: Speed is crucial for both mobile and desktop version of your site and it is officially part of the algorithm. It not only help you with your SEO efforts but also massively boost the user experience since most of the users want a fast loading page. So site speed means better ranking and it also directly boost the conversion rate. Hence it is a very crucial aspect of your site which you should be paying attention to. Need help with site load time? Connect with one of our Sales rep to assist you further. Google unveiled the option to book appointments with local businesses directly from the search results in August 2017 and since then they have been pushing it to local business owners in a very discreet manner. Maybe it’s because they don’t want to appear like a pushy salesman. However, this feature didn’t receive the kind of warm welcome they were expecting. It might be because people were not sure whether they are just testing it or planning to fully launch it before putting efforts, money and time into it. If you want to test this out (recommended), first you have to go to your GMB dashboard and check whether your business is eligible for the booking feature or not. And if your business is eligible, you will have to choose a third party provider from all the listed options. Yes, you read that right. Google has partnered with third-party booking services for this feature and you have to shell out anywhere between $20-$80 a month. But it “might” be worthwhile for you since bookings can increase given how convenient it is to book appointments directly from the search. Reach out to me at Brian@CustomerFinderMarketing.com if you have questions.